01 HOW MANY BIBLE CARTOONS HAVE YOU DRAWN SO FAR? There are currently 317 Old Testament Bible Cartoons on this website. There are currently 402 New Testament Bible Cartoons on this website. 01a HOW MANY GOSPEL ILLUSTRATIONS HAVE YOU DRAWN SO FAR? There are currently 15 Gospel Illustrations on this website. 01b HOW MANY META4 PICTURES HAVE YOU DRAWN SO FAR? There are currently 33 Meta4 Pictures on this website. 01b HOW MANY BIBLE MAPS HAVE YOU DRAWN SO FAR? There are currently 14 Bible Maps on this website. 01.1 What are some of the benefits of using Bible Cartoons, what can I use them for? 03.1 What is the difference between Bible Cartoons, Gospel Illustrations & Meta4 Pictures? 03.2 Why can I see letters (Watermarks) on the cartoons displayed? 03.3 Why are there 3 different sizes/qualities of Bible Cartoons? 03.4 Cartoons for free... really?! 03.5 Which Cartoon Quality do I need? FREE Bible Cartoon files to download and test! 03.6 Is there a limits to enlarging cartoons I buy? 03.7 Can I use your cartoons on my website? 03.8 I need 300dpi Bible Cartoon artwork, can you provide that? 05.1 How do I buy cartoons? The Purchase Process explained. 05.2 Can I pay on my Credit Card without having to open a PayPal account? 05.3 Once I buy a cartoon, how long do I have to download it from the Bible Cartoons website? 05.4 How do I delete cartoons from the shopping cart before I buy? 06.1 Can I use Cartoons that I download for any project I like, provided I don't make any commercial benefit (i.e. money or profit) from it? 06.2 Can I use Cartoons that I download from this website for any project I like, provided that I credit Bible Cartoons? 06.3 I’ve bought Bible Cartoons & want to send these files to other people, can I do that? 06.4 What text should I use, as a credit to you & Bible Cartoons? 06.5 Who owns the copyright on images I purchase, you or me? 07.1 Are you a traditional painting or a digital artist? 07.2 How do you draw & colour these cartoons? 07.3 How long does it take to draw & colour a cartoon? 08.1 Why do you draw cartoon illustrations based on Bible stories? 08.2 Who are these cartoons intended for? 08.3 Do you have Mission & Vision Statements & what are they? 08.4 Where do your ideas come from? 08.5 Which version of the Holy Bible do you use? 08.6 Do you mean to offend people? 08.7 Aren’t you trivialising the Bible by drawing cartoons about it? 09.1 Which artists have inspired you? 09.2 What inspires you? 11.1 If my computer/hard drive crashes, will you regenerate the download links to my previously purchased products so that I can have them again? 11.2 Could I make a donation? 11.3 My question isn't answered here. Where can I send my question? - Contact me. 02.1 What are some of the benefits of using Bible Cartoons, what can I use them for? 01) Cartoons are excellent tools to express your ideas, concepts and points in fun and visually stimulating ways. 02) Sermons and other presentations (both written and spoken) can be greatly enhanced by using colourful and dramatic cartoons. 03) Cartoons are fun and can be used successfully in witnessing and outreach. 04) Cartoons are visually powerful and engaging for all ages and nationalities. The multi-cultural potential of cartoons is limitless. 05) Cartoons engage “visual learners” and can be helpful engaging those with limited education or literacy. 06) Cartoons can be used in many different promotional formats: leaflets, posters, flyers, advertisements, web pages, mugs, T-shirts, etc can all use cartoons to get Christ's message of salvation across succinctly, colourfully and powerfully. 07) Cartoons are great for engaging children and adults alike and my cartoons could be used to supplement and illustrate Religious Education (RE) classes in schools, colleges, seminaries and churches. 03.1 What is the difference between Bible Cartoons, Gospel Illustrations & Meta4 Pictures? Bible Cartoons are pictures that tell a story directly related to ONE particular part of the Bible. For example, the Bible Cartoon entitled “Genesis 06 - Before the Flood - Noah Preaching” is a single cartoon that refers specifically to chapter 6 of the first book of the Bible (Genesis). There are also sets of cartoons which together depict a single story from the Bible. For example “Matthew 18 - Parable of lost sheep” has 5 Bible Cartoons that show the whole story in 5 scenes. Whether a single picture or a whole set of pictures tells a particular story, I refer to them as Bible Cartoons because they are taken directly from ONE particular passage of the Bible. Gospel Illustrations tend to show overarching themes from several, or many books of the Bible. They are more often themes we find running throughout the whole Bible, or they might be concepts which may span many of the books, or all of the Bible, rather than being directly related to a single passage or part of the Bible. 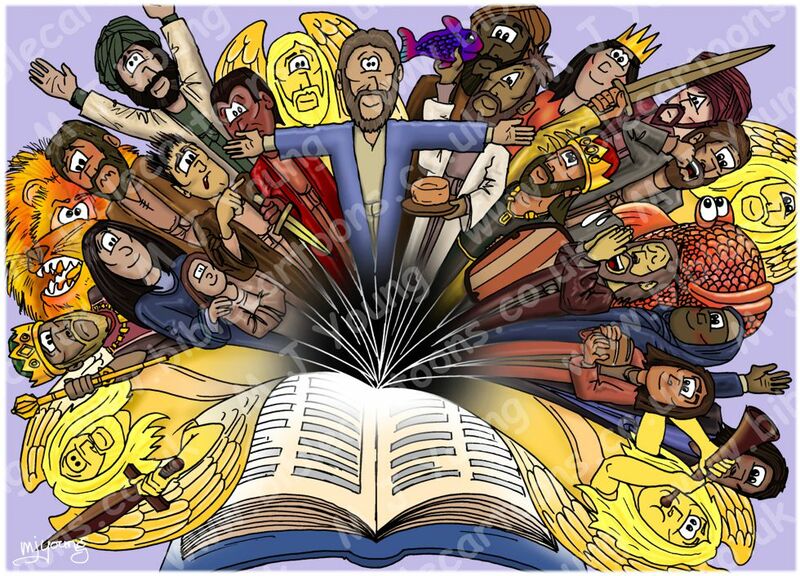 For example my “Bible Book Explosion” illustration (see below) is a picture made up of many famous scenes & stories in the Bible, all rolled into one design. The illustration shows many characters “jumping out of” an open Bible. It is meant to convey the rich & varied cast of characters & events that make up the whole Bible. Although all the characters in this picture are themselves directly from the Bible, the whole illustration does not represent a single, particular Bible story, so I classify it as a Gospel Illustration NOT a Bible Cartoon. Meta4 Pictures Are much broader in scope than either Bible Cartoons or Gospel Illustrations. They are often inspired by sermons or things that I have heard or seen, & which remind me of an important idea. They may relate to the Bible, or Christianity, but can also be about life, business, development, art, church or just about anything else! I hope that makes it clearer why I differentiate between Bible Cartoons, Gospel Illustrations & Meta4 Pictures. 03.2 Why can I see letters (Watermarks) across the cartoons displayed? As you’ve probably noticed, the cartoons on display on this website have a watermark across them - the feint white or black text that reads “www.biblecartoons.co.uk” with my name. This is to prevent people from copying the display-quality cartoons & using them. Please note that the Free cartoons (230 x 170 pixels approx. ), the Medium quality cartoons (840 x 600 pixels approx.) & High quality cartoons (1750 x 1260 pixels approx.) cartoons that I provide do not have a watermark across them. 03.3 Why are there 3 different sizes/qualities of Bible Cartoons? 03) Download a Free version of the cartoon. Different people like different qualities of cartoons. Some people object to paying anything for my artwork (!) so I supply them with low quality free ones - how kind! Other people realise I spent a L-O-T of my time drawing cartoons & want to purchase them to support me & the Bible Cartoons project - hurray for them! By supporting me with a purchase you make it possible for me to draw more cartoons - that’s good! 03.4 Cartoons for free... really?! Yes, I really do provide all the cartoons you can see on this website to you, for free! The free versions of these cartoons are quite low quality, only 230 x 170 pixels. See “Which Cartoon Quality do I need?” below for an explanation. Why do I provide free cartoons to viewers? Because I recognise that Jesus Christ is an amazing God, who has given me so much in life that I want to share His blessing with other people. Providing free cartoons is my way of doing that. You can download any cartoon free of charge, just by clicking on the “Download free Low Quality cartoon” button whenever you view a cartoon. I provide the cartoons free of charge because I’d like preachers, pastors, evangelists, church leaders, youth pastors, youth workers, etc to use these cartoons in their church activities, missions & ministries. But really I’d like it if anyone, anywhere uses them in ways that glorify Jesus Christ. 03.5 Which Cartoon Quality do I need? Which quality or resolution should you buy - Medium Quality or High Quality? That depends on what you’re going to use the cartoon for. 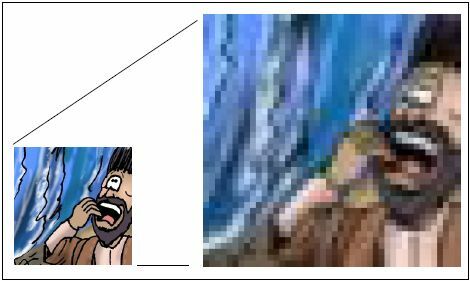 If you stretch a low quality cartoon file to fit onto a page, then it may start to pixilate, or look blocky. The more you stretch a picture, the more you are enlarging the pixels that make it, which is why you can suddenly see them. The picture below shows what I mean. The man’s face looks crisp & good when the picture is small, but if you stretch the picture too much, then you can see all the little pixels that make up the cartoon... yuck! So how can you avoid seeing a pixilated, or blocky cartoon? The simple answer is to buy the high quality one, which has more pixels & therefore can stand to be stretched far more onto a page, before you will start to see the pixels that make up the picture. So, when you are considering which quality or resolution to use, the higher the number, the higher the quality of the cartoon image. When in doubt, buy the high Quality version, which only cost £2 (GBP) anyway, & you won’t go wrong! 03.6 Is there a limit to enlarging cartoons I buy? Yes. The higher the quality, or resolution (in dots per inch) of a cartoon, the more you can stretch & enlarge it before you start to see the pixels that make the picture. Free cartoons I recommend that you do not stretch or enlarge the free cartoons beyond about 100 x 72 mm in size, on a page. Files are made available .jpg file format & are about 70Kb (Kilobytes) in size, which is pretty small. Free cartoons - enlargement by projection If you try to enlarge the Free cartoons by projecting them onto a screen then they will look blocky & awful! If you want to project a cartoon on screen (in a church sermon, for example) or print a cartoon in a larger document (like an A4 church newsletter, or on a poster) then I recommend that you buy the cartoon at either medium or high quality. Medium Quality cartoons Medium Quality cartoons can be enlarged to A4 size (210 x 297 mm) & will look very good. If you enlarge the cartoon beyond that size it will begin to pixilate or look blocky & won’t look so good. It will still be OK at A3 (297 x 420 mm) size, but will just look a little blocky. Medium Quality cartoons - enlargement by projection Medium Quality cartoons are sufficiently high quality to be projected onto screens in churches. But I would recommend you buy the high quality cartoon version if you want to enlarge the cartoon a great deal, in a conference hall, for instance. Medium Quality cartoons cost £1 (GBP) each. Files will be e-mailed to you in .jpg file format & are about .5 Mb (Megabytes) in size. High Quality cartoons These are the very best quality cartoons & can be used for just about anything! High Quality cartoons cost £2 (GBP) each. Files will be e-mailed to you in .jpg file format & are about 1.5Mb (Megabytes) in size. When considering which cartoon to buy, the high quality one is better & is recommended. 03.7 Can I use your cartoons on my website? If you want to use my cartoons commercially (i.e. to make money out of them) for self-published books, CD covers, magazines, leaflets, etc, then I ask you to e-mail me & we can talk terms. 03.8 I need 300dpi Bible Cartoon artwork, can you provide that? The Bible Cartoons, Gospel Illustrations, Meta4 Pictures and Bible Maps are all created at 300dpi (print quality), but are reduced to 150dpi (High Quality) and 72dpi (Medium Quality) for customers to purchase. NOTE: Bible Maps are ONLY available at 150dpi for purchase. Should you need 300dpi pictures, then please contact me on the link below, so that we can discuss your needs and negotiate a mutually fair price. Low quality (230 x 170 pixels approx.) cartoons are free. Just click the button “Download free 234 x 170 px Low Quality cartoon” & you’ll receive it. Medium quality (840 x 600 pixels approx.) cartoons cost £1 (GBP) each. Just click the button “Add to cart (£1 GBP) Med’ Quality cartoon (£1 GBP)” to add the cartoon to your shopping cart. High quality (1750 x 1260 pixels approx.) cartoons cost £2 (GBP) each. Just click the button “Add to cart (£2 GBP) High Quality cartoon (£2 GBP)” to add the cartoon to your shopping cart. NOTE: Bible Maps are ONLY available as High quality (1750 x 1260 pixels approx.) files costing £2 (GBP) each. Follow the link below to the currency converter, to convert £ (GBP) into your own currency if you live outside the UK. 05.1 How do I buy cartoons? The Purchase Process explained. 1) Select which cartoon(s) you would like to buy by clicking on EITHER the “Add to cart Med Qlty £1 (GBP)" button OR the “Add to cart High Qlty £2 (GBP)". 2) When you have added all the cartoons or illustrations you would like to buy, click the “checkout” button, which is under the shopping cart on the right hand side of the Gallery page. 3) You will automatically be taken to the PayPal payment pages. Make your payment there. 4) Once you’ve done that, you will be sent an email (to the email address you supplied in PayPal) which contains the hyperlinks to all the Bible Cartoons you just bought. 5) Click on the hyperlink in the email & you will see the artwork in your browser. From there you can save the file to your own computer. The same advice above applies to buying Gospel Illustrations, Meta4 Pictures and Bible Maps. 05.2 Can I pay on my Credit Card without having to open a PayPal account? 1) Click on the checkout button (in the shopping cart box on the right of the page) once you’re ready to pay. 2) You will see a page like the one below. 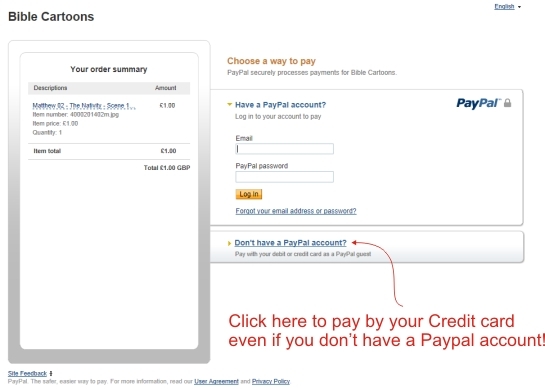 3) Click on the “Don’t have a PayPal account?” link, and you will be taken to a credit card payment page. 4) Fill in your Credit Card details & pay for the cartoons &/or merchandise. 5) Once completed, the cartoons will automatically be sent to you via email. The email will contain hyperlinks. When you click them the file is open on your mobile/tablet/computer. Then you save them to a convenient place. ... And not once will you have to open a PayPal account! 05.3 Once I buy a cartoon, how long do I have to download it from the Bible Cartoons website? The email containing hyperlinks which you receive, after paying for the cartoons, has a 60 day expiry date. That means that after 60 days you will no longer be able to download a cartoon using the hyperlinked email I send you. For this reason I advise you to open the hyperlinked email & save the cartoons to your mobile/tablet/computer as soon as you purchase them. 05.4 How do I delete cartoons from the Shopping cart before I buy? It’s easy to delete any cartoon from your shopping cart, just click on the little red cross in the shopping cart & you’ll remove the cartoon from your order. 06.1 Can I use Cartoons that I download from this website for any project I like, provided that I don't make any commercial benefit (i.e. money or profit) from it? Yes, you are free to use the downloaded cartoon(s) for personal projects, provided you do not seek to use them for making money. For example, if you want to project them onto a screen (at church, for instance) or to use them in a church bulletin or notice sheet, which you do not charge any money for, then you are free to use these cartoons. In the event that you want to use Bible Cartoon products for profit, please contact me, via the link below, so that we can discuss your needs. 06.2 I can use Cartoons that I download from the Bible Cartoons website for any project I like, provided that I credit Bible Cartoons? I ask everyone who downloads cartoons from Bible Cartoons to provide a credit on any & all your project work. If you use my cartoons in your church newsletter, or some other printed materials, then you must include a credit, attributed to Bible Cartoons. If you use these cartoons in a sermon, then please let people know where you got them from, which helps both you & me to promote the cartoons, & therefore to promote the cause of Jesus Christ & Christianity. 06.3 I’ve bought Bible Cartoons & want to send these files to other people, can I do that? I respectfully ask you NOT to do that. I have made the cartoons very low cost (merely £1 or £2 (GBP)) deliberately, so as to make them readily available & affordable for almost everyone. This is a conscious decision to make the cartoons available to as many people as possible. If you know someone who would like to use the cartoons that you have, then I ask you to PLEASE direct them to the Bible Cartons website, where they can purchase their own copy. Please resist the temptation to send anyone the files you have downloaded, since that is wrong & illegal. Please do not redistribute or make available the original computer files that you have purchased from Bible cartoons to anyone else. 06.4 What text should I use, as a credit to you & Bible Cartoons? Whenever you use a cartoon in some project, you must credit Bible cartoons somewhere in your printed material. 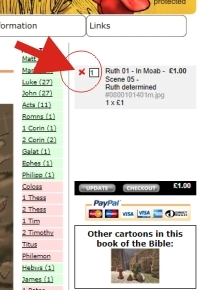 Something like, "cartoons kindly supplied by Martin Young - www.biblecartoons.co.uk” would be very much appreciated, which will encourage your readers/viwers to come & see the cartoons on the Bible Cartoons website for themselves. You can place the text on the back of your published materials in small text, provided it can be read, of course! 06.5 Who owns the copyright on images I purchase, you or me? Under copyright law the cartoons on this website are protected & remain the sole intellectual property of Martin Young. I grant permission for anyone to use the Free cartoons in a non-commercial way. In other words, if you just want to show my cartoons on your own website, use them for a church sermon, presentation, in youth work, or any other non-commercial venture (but will not be making any money from them) then that's OK by me. 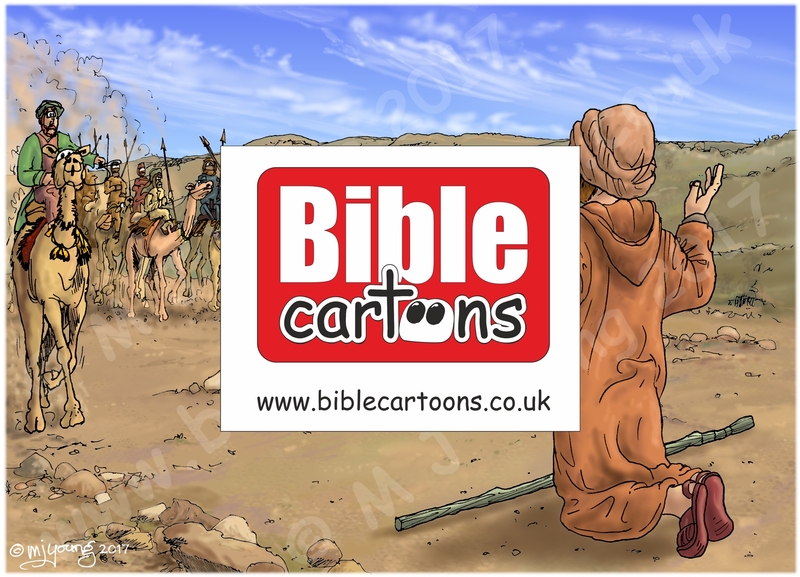 I would ask that you put a credit on your website or printed materials, something like this "cartoons kindly supplied by Martin Young - www.biblecartoons.co.uk” which will encourage your readers to come & see the cartoons on this website for themselves. If you purchase the Medium Quality (840 x 600 pixels approx.) or High Quality (1750 x 1260 pixels approx.) cartoons, then please note that the copyright & ownership of the original cartoon artwork remains with me. When you buy a cartoon or illustration from this website you are effectively buying a licence to use the cartoon image, for strictly non-profit making purposes. You are not buying the copyright for that image. If you want to use my cartoons commercially i.e. to make money out of them, for example to illustrate a book or magazine, to use on a CD or DVD case cover, to make posters, T-shirts, mugs or any other merchandise, etc which you intend to sell for profit, then I ask you to contact me & we can negotiate a mutually acceptable price. 07.1 Are you a traditional painter or a digital artist? I started out drawing about as far back as I can remember. That seems to be true for many artists. I’ve always found drawing easier than traditional painting, because the brush I hold seems to have a life of its own! The paint just doesn’t seem to end up on the page where I want it to go! Now I work digitally, with a computer, graphics tablet & stylus/pen, which really suits me a whole lot better! 07.2 How do you draw & colour these cartoons? I read a bible passage & see if any cartoon ideas come to mind. When they do, I draw a quick sketch in pencil. If it seems to have merit, then I proceed to sketch out in more detail & then ink in with drawing pens. I then scan the drawing into my PC & colour using Corel PHOTOPAINT. I use a graphics tablet & stylus/pen to do the colouring work. 07.3 How long does it take to draw & colour a cartoon? It takes me about an hour to pencil sketch the cartoon & then perhaps another hour to ink in the drawing’s outlines. The colouring in (on the computer) is the longest part of the process. In the early days of Bible Cartoons my style was fairly simple, but over time I have added more details to my drawings; often more dramatic lighting effects, etc. All of that extra detail takes more time to finish, of course. In the early days I might have taken 3-6 hours to colour up the work, sometimes it takes 6-10 hours on the most detailed designs of all. 08.1 Why do you draw cartoon illustrations based on Bible stories? I like cartoons! I like the exaggerated faces & bright colours. I also like the power & impact that cartoons can have. I like the way cartoons can be used to comment on all aspects of the human condition. I also have a Christian faith... I believe in Jesus Christ. So it makes sense to “marry” my interest in cartooning with my faith. I’ve tried drawing lots of other subjects but nothing engages me quite as deeply as cartoon illustrations based on Jesus & the Gospel. So I draw Christian cartoon illustrations because I believe in the power of the cartoon medium, & in the power of the Gospel. What a combination! 08.2 Who are these cartoons intended for? In a nutshell, the intended audience is anyone & everyone! Having said that, I think that cartoons based closely on the scriptures could be useful to several groups of people. I hope that busy pastors, preachers & teachers will use them. After all, there is nothing quite like a cartoon to bring a sermon to life! I also hope that missionaries & others engaged in mission work might find them useful. For instance, missionaries need to find financial support for their work, so why not use one of my cartoons in a presentation to a church, in an effort to help gain support? Then again, busy youth workers, or other members of a church might like to use the cartoons to illustrate a point they are trying to make to their various flocks. I also hope book & magazine editors & publishers will be interested in these cartoon illustrations. It would be great to see this work published that way. I have customers from all over the world buying the cartoons, predominately in the UK & USA, but also in Canada, Australia & New Zealand, Europe, the the Far East. I’ve sold to individuals, churches, companies, charities & various organisations. 08.3 Do you have Mission & Vision Statements? What are they? What’s a mission statement? A mission statement is a brief description of an individual’s or a company's fundamental purpose. A mission statement answers the question, "Why do we exist?” It describes what your values are, what you do, and who you serve. What’s a Vision statement? The vision statement answers the question, “Where do we want to go?” It’s about your dreams and hopes for yourself or your business. It reminds you of what you are trying to build. The difference between a mission statement and a vision statement is that a mission statement focuses on your present state while a vision statement focuses on your future state. 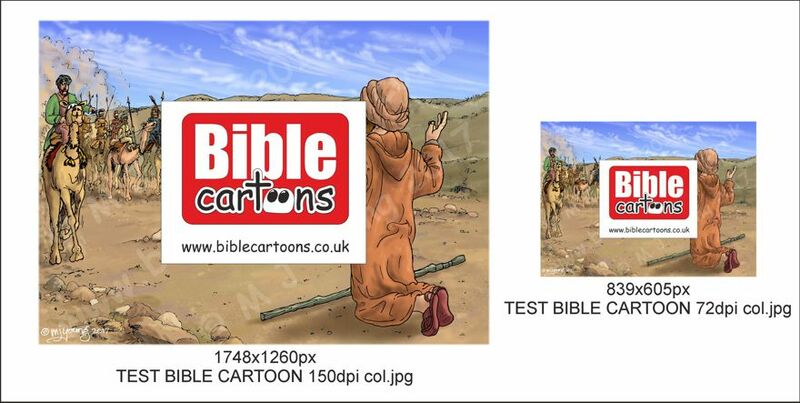 To provide artistically strong Bible cartoons to evangelise, encourage, educate & entertain. To encourage Christians in their faith & to deepen their desire to study the Bible. To challenge others to look into the Good News of Jesus Christ & help them make a decision to become a Christian. I’ve modified, changed & re-written these statement lots of times, as new concepts & ideas come to me... no doubt I’ll do that again in the future! 08.4 Where do your ideas come from? The Holy Bible is the source material for all these cartoon illustrations. But that then begs the question, "how do you "see" the scene in your imagination?" Well, that is often literally a picture that I get in my mind. Sometimes it is very clear & all I have to do is transfer that picture or scene onto paper. At other times the scene can be maddening elusive & it takes me a long time to get it right. At times like that I find that drawing lots of little sketches & doodles helpful, as I try to work out how best to illustrate the scripture in question. On a spiritual level, I guess my inspiration comes from God Himself. My Christian faith is what provides me with the inspiration to draw these cartoons from the Bible. 08.5 Which version of the Holy Bible do you use? I am aiming to provide cartoons that depict the scene as read from the Bible... "which Bible?" you may well ask?! Mainly I use the New Living Translation (NLT), but I also refer to the New International Version (NIV), The Message (MES), & have even been known to dip into the English Standard Version (ESV) & the King James version (KJV) too. When I am researching a passage from the bible for a possible cartoon, it is useful to read the same passage in different versions of the bible, to find something that inspires my imagination. I also refer to a number of commentaries on the Holy Bible, as they provide valuable insight & background to the Bible’s stories, which can help me to figure out what I want to say, in the finished illustration. 08.6 Do you mean to offend people? The cartoons that I have produced are based on the words I read in the Holy Bible. It is not my intention to shock or offend anyone. I sincerely hope that you, the viewer, are not upset or offended in any way, by what you see on this web site. Having said that, Jesus himself, when he walked the earth, offended a lot of people, not least of which the Pharisses & Jewish leaders he came into contact with! Truth can have that effect on people. Truth shines like a laser beam into the hearts of people, & often exposes parts of their character & nature that they do not want to admit to. If you find that anything in these cartoons prompts a reaction in your heart, please let me know. 08.7 Aren’t you in danger of trivializing the Holy Bible by drawing cartoons about it? Some people might say that by drawing cartoon illustrations based on the scriptures, I am making light of the gospel message: that I’m trivializing the Holy Bible. That is definitely not my aim. Indeed, nothing could be farther from the truth. I hold both God & His Holy Bible in the highest esteem. I am committed to living out my life here on earth as a Christian artist, to the best of my ability. I suppose that the word “cartoon” conjures up images of irreverence & poking fun at any & all subjects. Many cartoonists, all through the ages, have used this artistic medium to lampoon pretty much all subjects - sacred, or otherwise. Since my subject is the Holy Bible, people might be forgiven for thinking that I am therefore trying to make light of the gospel. Whilst I am using my God-given artistic talents to illustrate the Bible stories in cartoon style, my aim is to try to make the Bible accessible to visual learners & people who would like to see it’s truth, in pictorial form; to engage with the gospel as fully as possible. Whilst my artistic style is cartoon in form, my aim is not to belittle the Holy Bible, but rather to echo it; to transmit it to an audience who might not otherwise engage with it; to maximise the gospel message, rather than to minimise it. I seek to bring glory to God, using my cartooning skills, & to spread the gospel message to as wide an audience as possible. 09.1 Which artists have inspired you? I suppose the obvious answer is the Lord God Almighty. As I’ve said above, I believe the Lord provides all of my artistic skills, but I think He provides absolutely everything: the body I have, the time I inhabit, the world I enjoy, even the air I breathe, so in a real sense I do believe that God is the ultimate inspiration for me & the cartoon artwork I create. I enjoy sunrises & sunsets - who doesn’t? I have an analytical mind, so that I enjoy figuring things out, how they work, etc. I enjoy the sciences, which help us to understand how the universe works. Every science discovery leads me to marvel even more at the ingenuity & creativity of our amazing God who created it all. I love the sea, even though I live about as far away from it as you can get in the UK... how did that happen?! I have found my interest in the Holy Bible rocketing as a result of designing & producing these Bible Cartoons. In fact, I am much, much more interested in history, geography, architecture, textiles & clothing, animals, plants, etc than I ever have been. All of these things seem very relevant to me now, as I seek to depict these Bible images in as realistic, historically accurate & Bible-honouring a way as I can. 2) Enjoy what you do. 3) Never, ever, give up on your particular dream. Draw what you enjoy drawing. Drawing should be about fun. If you enjoy what you draw, it will show in your work. What you love should be the subject of your drawing. Don’t draw what other people want you to draw. Be true to yourself & to your particular dreams. Practice a lot! Find something you enjoy drawing & draw it a lot. Don't give up. The important thing is not to give up. And try not to compare your work with that of other people’s either, especially professional cartoonists / artists. Their skill & finished works are the result of many years of hard work, & you can’t become a master cartoonist or artist overnight. We do not get very long to live on earth, so why do something that you don’t enjoy? That goes for subject matter in art as well. What’s the point of drawing or painting something purely because you hope it will sell... purely for financial gain? Rather, draw & paint what you are passionate about; what you love. That kind of passion will show in your work. It is detectable, not just by fellow artists, but by everyone who sees your art. Life is too short not to pursue your passion. It is a waste of your precious time on earth to draw or paint anything that you do not avidly believe in. Never, ever, give up on your dreams - for any reason! Pursue them with all the courage & determination you can muster. I believe we each have a unique, God-given personality, with skills & talents particular to us. Part of our “job” whilst here on earth is to discover our talents & skills & to develop them as far as we dare to. For me, the most important thing is the imagination God has given me & the powerful desire to be creative, through art. When we pursue these things, we are truly living up to our potential. 11.1 If my computer/hard drive crashes, will you regenerate the download links to my previously purchased products so that I can have them again? Regrettably, no, we will not regenerate download links again after the initial download period is over. Your computers health is really your responsibility & making backup copies of products is simply good practice! 11.2 Could I make a donation? Any money that I get from sales of cartoons is used to keep this website going & to market & promote the cartoons, so that more people will become aware of them & hopefully start to use them. As you can imagine, it takes quite a long time to produce each cartoon (about 4-6 hours on average) that you see on this website. It also takes time & effort to update & improve the website, to market & promote the Bible Cartoons Project. In order to keep this website running, & providing the cartoons to the public, would you consider making a donation? Just click on the “Donate” button on the Gallery page. 11.3 My question isn't answered here. Where can I send my question? If you would like to discuss your particular requirements or if you encounter any difficulties with downloading the cartoons, please also send me an email. I want happy customers, after all!